It happened when I was in my fifth year of elementary school. In the school's broadcasting club there was a boy called Suzuki, who just got a ham license. One day, a pretty looking girl in the club teased me by saying "Suzuki-kun is great, isn't he? He is an elementary schoolboy like you. But, he already possesses a ham license!" I felt deeply touched by this statement her and instantly made up my mind to impress myself on her imagination. I then asked Suzuki-san - he was one year senior to me - if he could give me technical guidance on how I could get into ham radio. Suzuki-san was very kind and gave me not only guidance but also some junk parts such as used coil, and I started making a crystal radio. It did not last long before I got addicted to building radios. In order to receive ham radio communication in short wave bands such as 3, 5 and 7 MHz, I constructed receivers using vacuum tubes. I first built an ordinary three-tube and a four-tube radio receiver then a five-tube super heterodyne receiver. I prowled around from garbage collector or junk dealer to another. I usually paid 30 or 40 yen, at most 100 or 200 yen to buy a piece of waste article, dismantled it to collect usable parts and made from them new equipments with my own design. At the time 9R-59 receiver and TX-88A transmitter, both products of Trio, were shining in many ham shacks. Whenever I saw such super equipments, my heart beat faster and ached. But, different from classmates who receive much allowance, such expensive products were not at all affordable for me. Therefore I had no other choice other than making receivers and transmitters by myself using junk parts. Occasionally I made up my mind and bought brand new electronic parts. They were then for me more valuable than any precious jewelry. For instance, germanium diode SD-46 was with its white painted glass case and long elastic leads so smart and cute. I was overwhelmed with fascination when I unpacked a nice-looking GT tube or a slender MT tube. Vacuum tubes were incredibly beautiful, when they were dimly lit for the first time after finishing assembly. Movements of Siemens style switch and poly variable capacitor were so sensual that I never got tired of watching them. I got a ham license in the first year of junior high school. I saved my allowance and managed to make a small transceiver. Then, I elected two bamboo masts with the help of friends and set an antenna wire between them. Thus I opened my ham station a year later. By the time cheap germanium transistors such as 2SB110 came on the market at reasonable prices such as 100 yen per piece. Therefore I handcrafted my receiver solely with transistors. As for transmitter I used transistors for low power stages and was satisfied with the results. In order to make electronic equipment with transistors, I used to write circuit pattern with magic marker on copper-plated thin Bakelite board. Then dissolve unnecessary copper in carbon tetrachloride solution and wipe away the magic marker ink. The circuit was ready. Then bore small holes, mount electric parts and solder them. When I indulged in such works, I felt as if I were in paradise. As I had very little money, I repeatedly sketched circuit designs on papers before I finally started with the real work. In order to make beautiful circuit design, parts lay-out and solder work, I paid highest attention to every detail and felt a lot of pleasure in the strained work. Among a number of my hand-made equipments the latest work - a receiver with 1 RF amplifier and 2 IF amplifiers - was for me the real masterpiece with the nearly perfect chassis and board design. However, it was dumped by my parents while I was away from home for a long time. I cannot stop regretting over this misfortune. 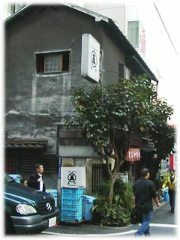 Akihabra Radio Center is still alive. High-tech parts are sold in tiny shops. Anyhow I became a regular Akihabara visitor already at the beginning of the 1960s. It was not easy for an elementary school student to go to Akihabara, because I lived about an hour distance by train from Akihabara and going to Akihabara involved lots of fringe costs including railway ticket costs: 110 yen for one way and 220 yen for both ways. Therefore, I first compared all available price offers using advertisements on a ham magazine "CQ ham radio", then, calculated the amount on the basis of the cheapest offers. The total budget was at most 2000 yen because of my limited allowance. Arriving at Akihabara, I first checked the shops around the Station and Showa Street, then went more and more distant from there and finally on the other side of Manseibashi bridge, and tried to find parts cheaper than estimate. Once I spent 10 yen more than the budget, because I really wanted a ceramic capacitor. Then, on the way back home I could buy only a 100 yen ticket and had to get of at Inage the third but last station. From there, I walked more than two hours in the evening twilight. Kanda-gawa river seen from Hijiribashi-Bridge. Akihabara is on the left side. 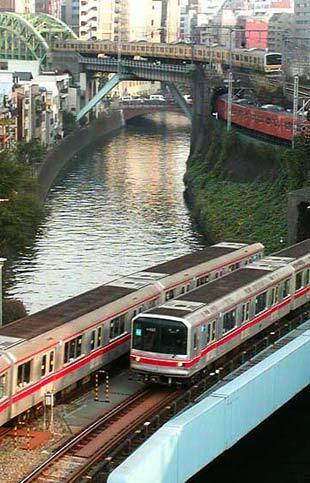 Sobu-Line, Chuo-Line and Subway Marunouchi-Line are crossing in three different levels at this point. In 1960s such a junction was unique and every child picture book on trains contained an illustration of such a scene. 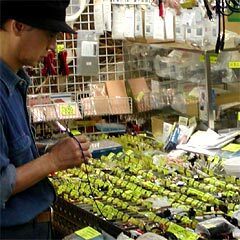 Prosperity of Akihabara started as black market of hand made radios after WWII. When I frequented there in the 1960s it was grown up to be a town for amateur hams looking for various electric parts. Then when personal computers came on the market in the 1980s, Akihabara came to attract pc freaks and volume sellers drastically expanded their business of both household appliances and pc related goods. Recently Yodobashi Camera and other discount shops promote their business outside of Akihabara on a massive scale. As a result, as far as PC and related parts are concerned, we have to go to Akihabara less frequently, but I still need Akihabara for acquiring electronic parts. The old Akihabara still retains its atmosphere in Radio Center and Radio Depart, though they too look slightly tidier than before. Shops for PCs and household appliances still have their strong presence in Akihabara. Nowadays the wall of Radio Kaikan is also covered by such an advertisement. However, by and large Akihabara is now a town for "otaku" culture. This trend started with small "dojinshi" shops in side alleys. Now you can see "moe" character posters everywhere. Young girls in "maid costume" are promoting latest products or new "maid café". Starting with computer game and anime, all kinds of sub-culture related industries have established their business headquarters in Akihabara. In the newly constructed buildings of Akihbara Crossfield companies and organizations related to manga, animation and other sub-cultures are accommodated and they are expected to lead the future IT industries of Japan. I would like to add some useful information about Akihabara at the end of my article. 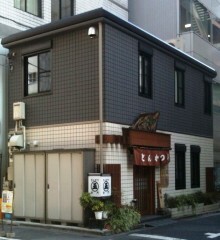 First, I cannot spare "Marugo" tonkatsu restaurant, when I go to Akihabara. It was an old style two story wooden house until a couple of years ago. Now it has a new building, but its tonkatsu has not lost the quality. Even if you are alone - many men go alone to Akihabra for shopping - you can find comfortable seats at the counter on the ground floor. Of course, cutlet is one of the best in Tokyo. The dark and thick sauce is a specialty of Marugo and I would strongly recommend it, because it is not as sweet as in many Kansai style tonkatsu restaurants. Another famous lunch destination in Akihabara is "Kyushu Jangara" rahmen restaurant, though I usually refrain from going there, because there is usually a very long queue for waiting. In the vicinity of Akihabara, there are interesting sightseeing spots such as Kanda Myojin, Yushima Seido and Nikorai-do. Behind the former Transport Museum there are a number of old and tasty restaurants in Sudacho. You cannot easily get out from the Akihabara area, once you stray into it. It is for me a "Bermuda triangle" with full of allure.